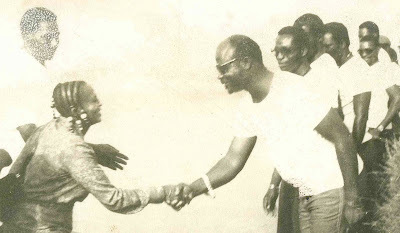 Benin's El Rego (pictured above, greeting Mariam Makeba at Cotonou Airport), is one of the great pioneers of contemporary West African music. At long last he's the subject of his own reissue collection, researched by Frank Gossner and released by Daptone Records You'll hear a track from it on this week's program, alongside one by the band he most famously influenced, Orchestre Poly-Rythmo De Cotonou. 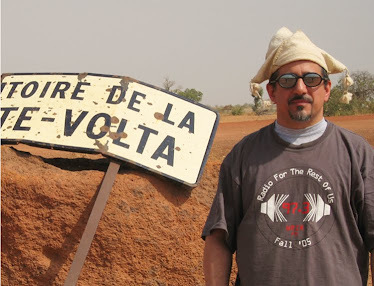 Also this week, first plays of new work by Mali's Tamikrest, Nguuni Lovers Lovers from Kenya, Greece's Kristi Stassinopoulou & Stathis Kalyviotis (as yet unreleased), and Ritmo Machine (a pairing of Chilean DJ Bitman and Cypress Hill's Eric Bobo), plus the new single by Richmond's own Os Magrelos.